Several years ago an elderly lady came into the shop and requested a custom broom. She said her mother used a broom to clean the silk off of the sweet corn and she described it as being smaller than a whisk with a longer handle that could be held like a fat paintbrush. She watched me make a couple brooms until we found one that would work for her and the Silker was born. I’ve since added a scrubber to the other end so you can also use it on your taters! These are about 10 inches long with an inch of bristle at the top for scrubbing, a 3 inch plaited handle and a 5 inch sweep. These small whisk-like brooms are also great at getting crumbs off countertops and tables. I’ve also been told that some folks use ‘em for picking up threads when quilting. Beautiful, unique and functional! It’s bound with wire, plaited with stalk or reed and twine, and stitched once with twine. Sometimes, you don’t need fancy. You just need to get the job done. The utility whisk is a bit smaller than the regular whisk, has a jute wrapped, wire-bound top, and only gets one row of stitching. Simple and small doesn’t mean cheap or ugly! We use 100% grade 1 broomcorn hurl, and we still double bind it (without the plaiting). The binding cord and the stitching cord are matched, so it looks nice while being usable. 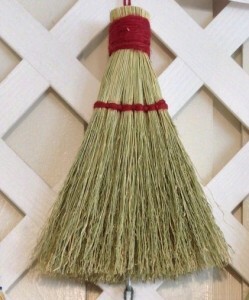 The perfect broom to keep in the car, with the dustpan,on the workbench, or next to a woodstove. My plaited whisks are typically about 12-inches in length. They weigh about 5 ounces and are bound with wire, plaited with stalk or reed and twine, and stitched twice with twine. The second row of stitching, the addition of a bit more broomcorn, and the use of color set this broom apart, increasing its appeal without decreasing its usefulness. This is the largest whisk I make, and it’s also the toughest! I start with 4 ounces of broomcorn and bind it tight with wire, I then add about 13 pieces of small craft corn and plait the top 4 inches of the whisk with this until I wind down and bind off. 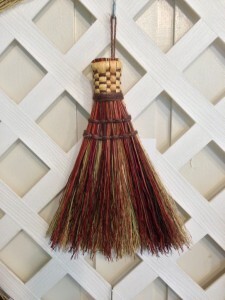 Inspired by the old fashioned look of the Shaker brooms, this whisk is a functional piece of art that can only be made when I have small pieces of craft broomcorn – limited in quantity, unlimited in use. This is the whisk people remember – we just upgraded it a bit. 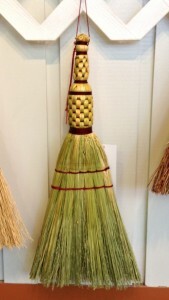 The broom is tied in layers with wire, then rebound with reed and twine. The shouldered bottle shape makes it perfect for tucking into a back pocket whether you’re working in a shop, detailing your car, or getting ready to whisk off home plate when umping a game. It’s a little stiffer than our other whisks, and a little lighter, too.